Paul seems to talk about we often. And writing this letter from Ephesus it would seem that the we at this time are the people he is surrounded by, the believers in Ephesus. The guys he was teaching, in public and in their homes. The people he did life with. Paul is often portrayed as a harsh individual where relationships are secondary. But this passage gives short consideration of that caricature. We read of tears many times. The fact that the leaders of this church were happy to make the 68 mile journey, in an age when walking was the mode of travel, to spend a short time with Paul speaks volumes. This was no leader locked in an ivory tower who kept himself to him self. This was brother on brother, flesh on flesh, friendship and deep love. Relationships were clearly vital to this great missionary and leader. Today too many leaders are lonely for no good reason. 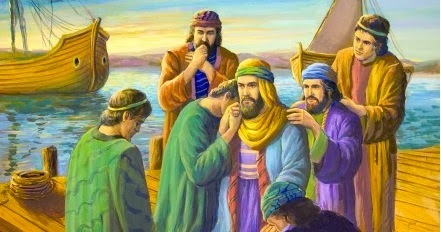 Paul never seemed to do life alone he always seemed to have travelling companions in the cause of Christ. Lets not do life or leadership alone!